Lava enters the ocean at Kapoho Bay, Hawaii, on Tuesday. 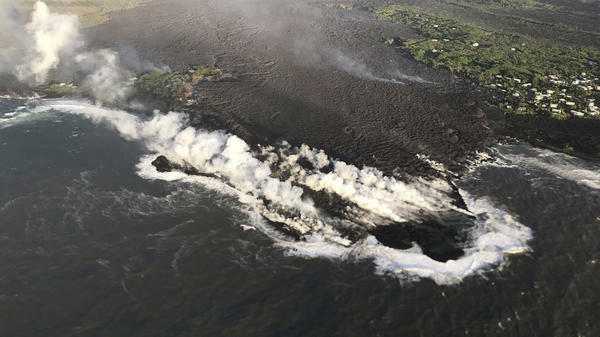 A U.S. Geological Survey morning overflight confirmed that lava had completely filled the bay. A wide, slow-moving river of lava from Kilauea volcano has claimed hundreds of additional homes in the southeastern corner of Hawaii's Big Island, officials say, marking what could be the most destructive day of the now monthlong volcanic eruption. Officials are still working to get an accurate count of damaged structures, but a flight by the U.S. Geological Survey shows blackened lava inundating a section of coastline that was once covered with lush forest and dotted by homes. The flow's forward edge is now pouring into the sea, filling the once-popular Kapoho Bay. "We don't have an estimate yet, but safe to say that hundreds of homes were lost," Janet Snyder, a spokeswoman for Hawaii County, told reporters. That would more than double the 117 homes that have been confirmed as destroyed during the continuing eruption. No injuries were reported in the most recent flow. Officials had been warning residents to evacuate the area for days, as they nervously watched the lava crawl its way downhill toward the coast and the Kapoho Beach Lots and Vacationland neighborhoods. The area is primarily home to vacation rentals, but there are many permanent residences there too. The flow, which is a half-mile wide in parts, entered the sea Sunday night, according to the Hawaii County Civil Defense, sending large plumes of "laze" — a dangerous mix of steam, gas and volcanic glass — into the air. The lava filling Kapoho Bay, an area that had been known for its tide pools and snorkeling, creates a delta of new earth more than a half-mile off the coastline. "Looking at the map right now, Kapoho Bay is now Kapoho Point," says David Mace, a spokesman for the Federal Emergency Management Agency, who has been helping with the emergency response on the island. The river of lava is emanating from a gushing fissure miles away, on the flanks of Kilauea in the Leilani Estates neighborhood. Lava has been fountaining from that fissure hundreds of feet into the air and volcanologists aren't sure when it will stop. A similar eruption in 1955 lasted for 88 days. Thousands of people have been displaced, and the slow-moving nature of the event has many living in a state of agonizing uncertainty. Lava has now covered about 7.7 square miles of the roughly 4,000-square-mile island, according to the USGS. Parts of the Big Island were rattled Tuesday by a magnitude 5.5 earthquake, the latest in a string of smaller earthquakes that have struck the island since the eruption started on May 4.